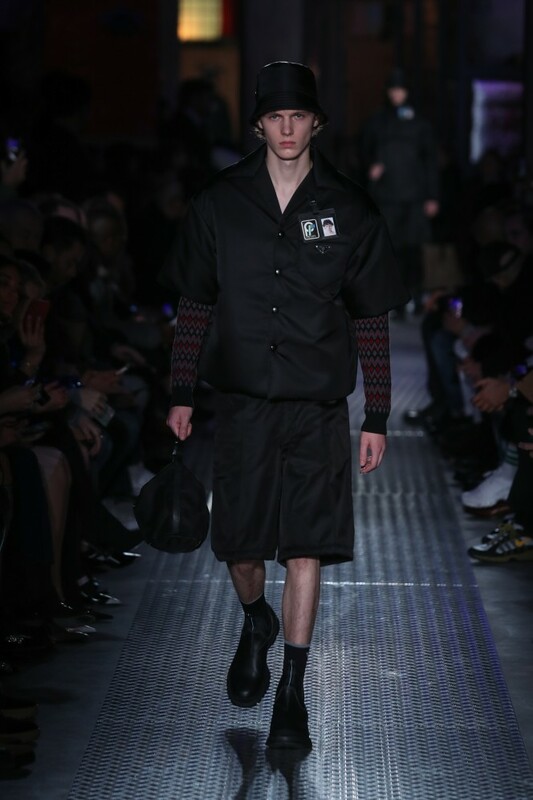 Traditionally holding collections at its HQ on Via Fogazzaro, Prada led us instead to Viale Ortles, a strip of bleak industrial depositories, for its FW18 menswear show. Prada wasn’t turning its back on tradition, though. 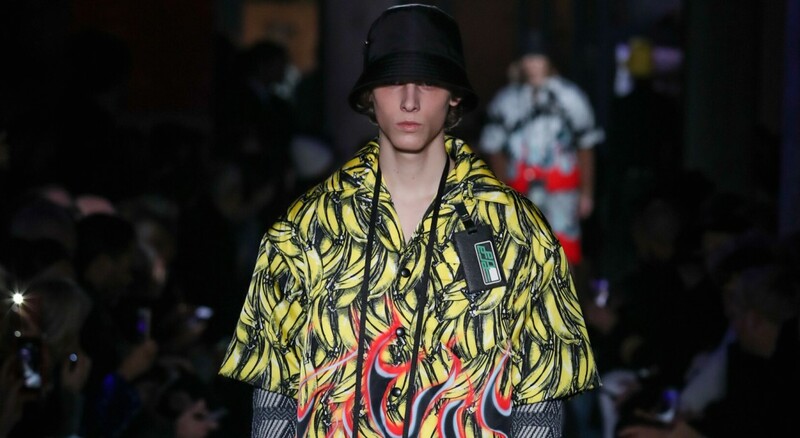 We were told, in fact, that the environment of the warehouse served as an ‘oneiric and surreal archive, where the multifaceted essence of Prada comes to life,’ and emblems of the brand gave genesis to the collection. With the runway space colonised with crates and shelves of shrink-wrapped palettes, and the opening looks, near costume of a space-age utilitarian uniform, it felt like someone was packaging the history of Prada ready to export to some other galaxy. Beyond these stark and padded outfits, archival prints made cameos, spliced and pieced together like fleeting dream-like fragments. Spring ’11 banana print here, Fall ’16 Cleopatra kissing Elvis there, while retro intarsia knitwear brought a gently sentimental feeling into the mix of memories. It all highlighted the true breadth of Prada’s identities – for there are few brands whose collections are quite so prolific and separated in their visual intensities as Prada’s. The runway unveiled collaborations with Ronan & Erwan Bouroullec, Konstantin Grcic, Herzog & de Meuron, and Rem Koolhaas. Each of these architects and industrial designers were tasked with re-imagining Prada’s signature black nylon. Koolhaas, for instance, moved Prada’s shell backpack to the front “to give a more intimate sense of ownership”, and re-visualised its interior to make it a more efficient object. Looking to the past? Sure. But Miuccia chose to call her collection, ‘Premonition’. There were remnants, maybe, but gathered, reassembled and transformed for new use in future landscapes.